In the long term, the greatest community benefit griefers confer may be the impetus to develop online governments. My November 2007 Escapist article "Real World Grief" proposed a "Griefer Standard," a defined data format companies might adopt to identify griefing players. If a game's Terms of Service permitted sharing of griefer profiles between companies, player complaints could work like criminal records. But this community policing will probably fail in all but the most popular worlds, because it doesn't scale well. In reaction, "users will elect from their own ranks worldmasters, patrollers armed with mighty server permissions and a direct line to the ban list. These Judge Dredd-like beat cops will mark, ban and report malefactors on the spot, in real-time." These worldmasters might eventually unite to pass local laws, initiating a true online world government. Just as anonymity allows griefing to exist, trust and reputation eradicate it. On the still-unsettled virtual frontier, as in the Old West, there is little trust - or at least little reason for trust. 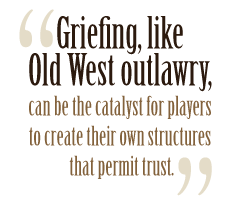 But griefing in itself, like Old West outlawry, can be the catalyst for players to create their own structures that permit trust. Already in EVE Online, the wildest and wooliest of Wild West frontiers, players have formed a Council of Stellar Management, essentially ombudsmen to the game's creators. In the years and decades ahead, bigger organizations with genuine power will emerge; authority will grow, and with it, trust. In well-run worlds, there will be nowhere for griefers to run. It's the same story seen over and over in the Old West and on every frontier: Lawless people, by their predatory actions, provoke the victims to join forces, create structure and make laws. Agents of chaos become catalysts of order. With any luck, the griefers will hate that. Choke it down, jerks.